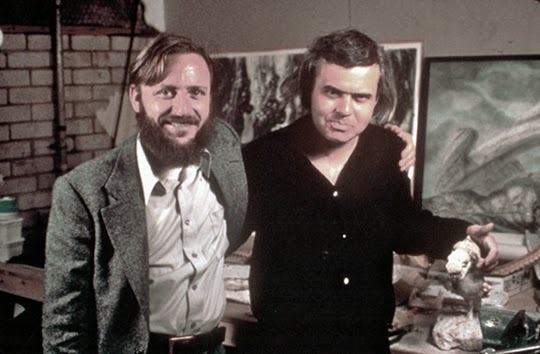 b) The first photo we see Dan O'Bannon visiting Giger , and in the second photo we see someone else standing quite tall in the background, standing before a drawing featuring of a humanoid with spikes radiating out behind it. 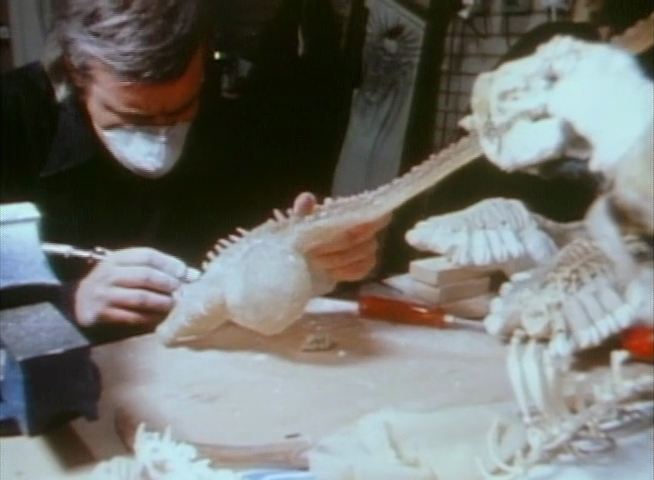 Giger had created the illustration on the actual door. After the end of the production, a Shepperton Studios staff member retrieved the door-panel from the boiler-room, he had intended to use the illustration as the logo for a new model company he was setting up. 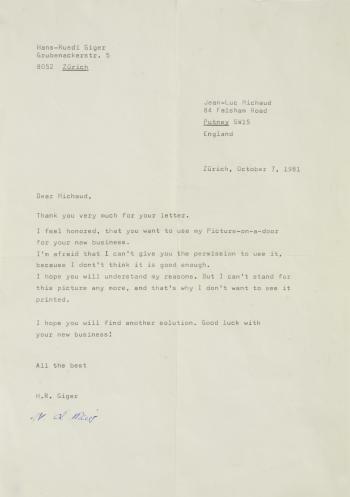 The vendor contacted Giger directly to ask permission to use his imagery and received a letter back dated 7 October 1981, which is included in this lot. 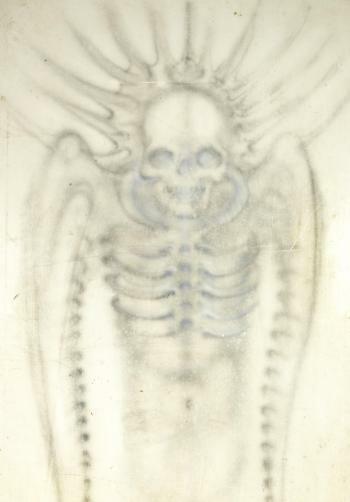 In it Giger stated "I feel honoured [sic], that you want to use my Picture-on-a-door for your new business. I'm afraid that I can't give you the permission to use it, because I don't think it is good enough." 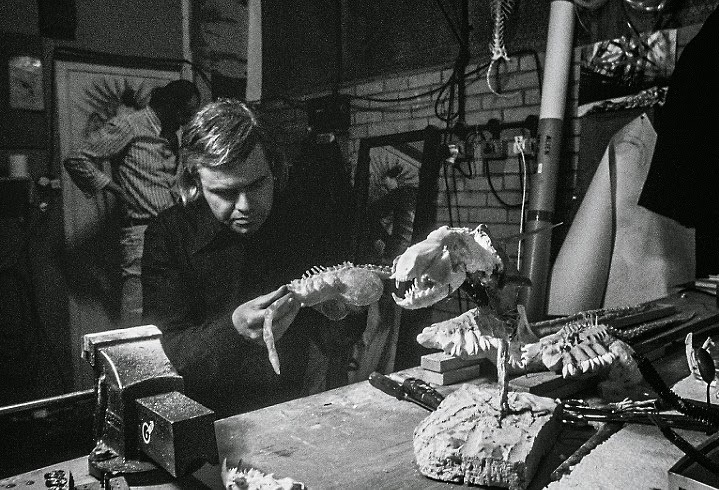 While working at Shepperton Studios H.R Giger had a studio which was loaned to him for the duration of the production for Alien, as well as adopting an additional workshop in one of the Shepperton boiler-rooms. He would often work there on concepts for the film, gaining inspiration from the industrial surroundings he found himself in. When the Alien production ceased a Shepperton Studios staff member retrieved the door-panel from the boiler-room, he had intended to use the illustration as the logo for a new model company he was setting up. The vendor contacted Giger directly to ask permission to use his imagery and received a letter back dated 7 October 1981, which is included in this lot. In it Giger states I feel honoured [sic], that you want to use my Picture-on-a-door for your new business. I'm afraid that I can't give you the permission to use it, because I don't think it is good enough.